Here we have an old photograph said to be Tin Miners out for a spin in their new motor car. 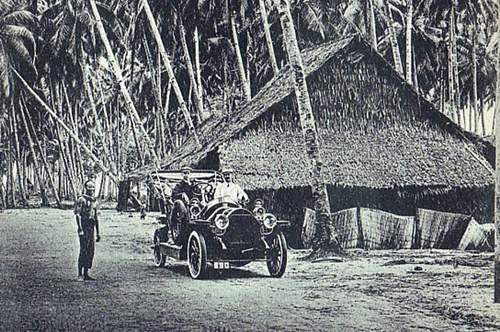 Clearly they were the “Haves” of Malaya at the time, but surely it was a pretty tasteless thing to do – driving into a Kampong to display your wealth to the natives. Not to mention filling their clean air with petrol fumes. But don’t get excited for we believe this was a deliberately posed photo to be put on a postcard and sent overseas to demonstrate the progress of Malaya to the world. But does anyone have any idea whether the above is true or is it all a load of rubbish we have been fed?